Cruise ships transiting the Panama Canal. Panama’s open registry service for vessels, its veil of secrecy on vessel ownership and its image as a tax haven have come under scrutiny as the world tackles terrorism, drug trafficking and other crimes. Before last week, we perhaps knew Panama more because of the Panama Canal, a piece of engineering marvel that, since its opening in 1914, has provided ships sailing between the Atlantic and Pacific a much shorter and less treacherous route. Had there not been the canal, ships would have to sail all the way down and around Cape Horn or through the Straits of Magellan at the tip of South America, before either entering the Atlantic or Pacific Ocean. The Panama Canal’s specialty lies in its series of water locks cutting through tropical rainforest and the isthmus where Panama is. There are no such locks at its West Asian counterpart, the Suez Canal. The French first started building the Panama Canal in 1881, but the project was abandoned, among others, because of the high mortality rate involved in its construction. The Americans took over in 1904, and the canal was completed a decade later. In today’s merchant shipping terms, ships classified as of “Panamax” class are those that may pass through the locks and safely sail under the Bridge of the Americas in Balboa, just outside of Panama City. They are generally mid-sized cargo ships. Recently, a third series of locks was built to allow what is known as “New Panamax” class vessels, which are slightly larger than the Panamax class ships, to pass through. This also reduced congestion at the canal. However, large ships such as of the VLCC (very large crude carrier) and ULCC (ultra large crude carrier) class cannot pass through the canal and are classified simply as “Post Panamax”. 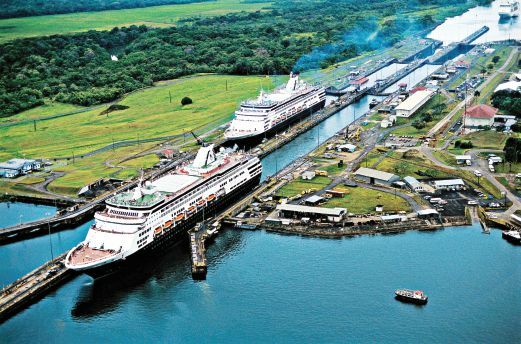 There is, however, another activity Panama is known for, and related to the shipping industry, which later expanded into the reasons why the small state got into the limelight last week. Completion of the canal in 1914 subsequently attracted larger volumes of shipping and in 1919, Panama started to offer ship registry services. Its first customer was United States oil company Standard Oil, and the reason why the giant company chose to register its ships in Panama was none other than to escape high US taxes and stiffer regulations at home. Since then, Panama has been offering, in merchant shipping terms, an open registry service where ship owners from anywhere in the world may register their ships there, instead of in their home country. In return, Panama imposed very low or no tax, supposedly less stringent ship inspections and a veil of secrecy as to the real ownership of the vessels. There is another added attraction, especially for American passenger ships, in that when registered in Panama, they may serve alcohol on board without limitations. These vessels, in turn, will be flying the Panama flag, which, also in merchant shipping, is called a “flag of convenience”, for obvious reasons. Open ship registry services have come under criticism for a long time as governments suspect ports offering flags of convenience have cut corners in inspecting seaworthiness of vessels. The Amoco Cadiz, an oil tanker which went aground off the coast of Brittanny in France while transporting oil for Shell in 1978, resulting in the worst oil spill at the time, was flying the Liberian flag of convenience. But still, what the likes of Panama offer to ship owners perhaps outweighs everything else. Today, more than half of merchant ships in the world are flying the Panama flag. Soon, Panama began extending what it has been offering to the shipping industry to the financial world at large. Simply called offshore finance, Panama began to offer simple, and no-questions-asked company incorporation facilities. With no taxes and no questions, Panama soon began to attract corporations that, for various reasons, preferred to remain anonymous. Strict confidentiality laws were put in place while the names of corporate shareholders in companies need not be publicly registered. Another attraction is the state’s banking secrecy laws, where banks in Panama cannot give information about offshore bank accounts or their account holders although it was said that it provided exclusions whenever there are investigations related to terrorism, drug trafficking and other serious crimes. It is silent, however, on tax evasion and Panama has no tax treaties with other nations, and neither has it got any form of exchange controls. The offshore financial business is, however, not fundamentally illegal. Panama hosts dozens of international banks’ offices and together with other offshore domiciles, such as the British Virgin Island, Luxembourg, the Caymans, Guernsey, Bahamas and a host others, they have their own special purpose of existence. We, in fact, have one too, in Labuan. US Fortune 500 companies hold trillions of dollars in offshore financial centres. But, it is when these centres compete in their services’ offerings, that things can get a bit out of hand. Perhaps, because secrecy has somewhat become the central offering among offshore financial centres, the usage of such domiciles has, in recent decades, raised the question of morality. Why would anyone or any company keep their wealth in a tax haven other than to avoid paying high tax at home, entirely escape tax, or hide sources of their funds? Some say the days of such tax havens are numbered. In the merchant shipping sector, there are increasing calls now by nations to stop the practice of issuing flags of convenience to ships, especially since more governments are concerned about the safety hazards posed by the supposedly lax inspection done on vessels by the maritime authorities at such ports. In the finance world, the global fight against terrorism and narcotics may have a bearing on the future of offshore tax havens as governments seek to plug the funding pipeline for such activities. The recent revelations in the so-called “Panama Papers” could well provide more impetus to end the veil of secrecy provided by such tax havens.